President Theodore Roosevelt was one of the most colorful of all the U.S. Presidents. It is no fluke that President Roosevelt is included among the Presidents portrayed on Mt. Rushmore. In addition to the political offices that he held including that of President, Roosevelt was also famous for his achievements as a naturalist, hunter, soldier, explorer, and author. He was an editor of Outlook magazine and he authored at least 18 books. One of the more endearing stories about President Roosevelt is how the Teddy Bear got its name. On a hunting trip to Mississippi in 1902, President Roosevelt refused to shoot a bear that had been caught, tortured and tied to a tree. The bear was covered in blood and mud and was not much bigger than he. The incident inspired political cartoons which soon appeared in the nation's newspapers. Later that year, F.A.O. Schwarz and a competing toy store began selling thousands of stuffed bears that soon became associated with the bears depicted in the political cartoons. Thus the Teddy Bear was born. 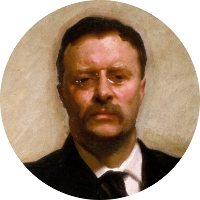 President Roosevelt has one of the more prolific ancestries when it comes to famous kin. In addition to the obvious relatives of President Franklin D. Roosevelt and his wife Eleanor Roosevelt, he is also related to Presidents Martin Van Buren and James Madison, inventor Thomas Edison, as well as the infamous Lee Harvey Oswald. A descendant of Charlemagne and Alfred the Great, he is also distantly related to Confederate Generals Robert E. Lee and J.E.B. Stuart, and to Helen Keller and the infamous Lizzie Borden.